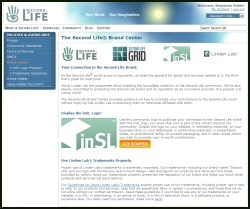 After years of largely ignoring widespread use of its trademarks on everything from in-world groups to business web sites, Linden Lab recently announced the launch of the Second Life® Brand Center, which features a new set of explicit, fairly restrictive guidelines regarding the use of the company’s trademarks. Finally, they say that they’d like you to put a ® symbol after “Second Life” and a ™ symbol after their unregistered trademarks (including Linden, LindeX, and SLurl) when you use the terms “in text,” and you’re also supposed to follow “Second Life” with a generic noun. For example, you are now asked to refer to “the Second Life® world…” instead of “Second Life.” This is widely misunderstood. The request is not enforceable against news organizations or most non-product-oriented blogs. It can only be enforced if there is potential brand confusion (e.g. in advertising for another product). That last bullet regarding the is use of the ® symbol “in text” is confusing to a lot of people and is worth exploring a little further. It does not mean that every news story and blog post about Second Life needs to include these symbols. You only have to follow these requests when your use isn’t considered “nominative.” Basically, when brand confusion is possible — in advertising. The key is that use of the marks in news coverage and analysis is considered “nominative use,” and doesn’t require any license at all — so they don’t get to tell you how to use the words in that context. The AP Stylebook guidelines say that trademarked names should be capitalized in text, which is appropriate because it helps avoid genericide (and angry letters from lawyers) but that’s really all commentators and reporters need to do in text. Note though: like any other brand identifiers, blog banners, names, and graphics are subject to the rules pointed out in the other bullet points above. Yes, reporting on Second Life in our blogs is nominative use, and under trademark law (US at least) we’re probably in the clear and don’t have to follow Linden Lab’s wishes that we mark things with an ® or say “my Second Life experience” rather than just “my Second Life.” However, isn’t there a wrinkle that comes out of the Terms of Service? The new ToS, and its section 4.4, mandate that we comply with LL’s guidelines on using their marks. By agreeing and continuing to use SL, haven’t we bargained away our ability to use the marks nominatively?